Showing 1–1 of 1 items. 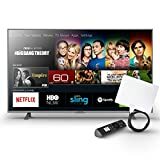 Watch live over-the-air TV broadcasts in HD with the Element 4K Ultra HD Smart TV - Amazon Fire TV Edition and AmazonBasics Ultra Thin Indoor TV Antenna - 35 Mile Range. Access live over-the-air TV broadcasts right from the home screen with a connected HD antenna. Easily browse TV shows using the built in channel guide, or use the Voice Remote with Alexa and say "Go to NBC". Experience true-to-life 4K UHD picture quality with over 8 million pixels for stunning clarity, deep contrast, and brilliant colors with Fire TV Edition. The Fire TV experience is built in so you can enjoy over 15,000 channels, apps and Alexa skills. Get universal search results across over 140 channels and apps including Netflix, Hulu, HBO NOW, SHOWTIME, STARZ, and Prime Video. The AmazonBasics Ultra Thin Indoor TV Antenna - 35 Mile Range supports HD broadcasts and includes 10 foot coaxial cable. It's easy to install with multi-directional signal reception, so no "pointing" needed to receive HD content.